Using data from NASA's Gravity Recovery and Interior Laboratory (GRAIL) mission, scientists have shed new light on the formation of a huge bull's-eye-shaped impact feature on the Moon. The findings, described in two papers published in the journal Science, could help scientists better understand how these kinds of giant impacts influenced the early evolution of the Moon, Mars and Earth. Formed about 3.8 billion years ago, the Orientale basin is located on the southwestern edge of the Moon's nearside, just barely visible from Earth. The basin's most prominent features are three concentric rings of rock, the outermost of which has a diameter of nearly 580 miles. Scientists have debated for years about how those rings formed. Thanks to targeted close passes over Orientale by the twin GRAIL spacecraft in 2012, mission scientists think they've finally figured it out. The GRAIL data revealed new details about the interior structure of Orientale. Scientists used that information to calibrate a computer model that, for the first time, was able to recreate the rings' formation. "Big impacts like the one that formed Orientale were the most important drivers of change on planetary crusts in the early solar system," said Brandon Johnson, a geologist at Brown University, lead author of one of the papers and a co-author of the other. "Thanks to the tremendous data supplied by GRAIL, we have a much better idea of how these basins form, and we can apply that knowledge to big basins on other planets and moons." In one of the Science papers, a research team led by MIT's Maria Zuber, a Brown Ph.D. graduate, performed a detailed examination of the data returned by GRAIL. "In the past, our view of Orientale basin was largely related to its surface features, but we didn't know what the subsurface structure looked like in detail. It's like trying to understand how the human body works by just looking at the surface," said Jim Head, a geologist at Brown, GRAIL science team member and co-author of the research. "The beauty of the GRAIL data is that it is like putting Orientale in an x-ray machine and learning in great detail what the surface features correspond to in the subsurface." One of the key mysteries the data helped to solve involves the size and location of Orientale's transient crater, the initial depression created when the impactor blasted material away from the surface. In smaller impacts, that initial crater is left behind. But in larger collisions, the rebound of the surface following the impact can sometimes obliterate any trace of that initial impact point. Some researchers had thought that one of Orientale's rings might represent the remains of the transient crater. But the GRAIL data showed that's not the case. Instead Orientale's gravity signature suggests the transient crater was somewhere between its two inner rings, measuring between 200 and 300 miles across. Any recognizable surface remnants of that crater were erased by the aftermath of the collision. Constraining the size of the transient crater enabled to team to estimate how much material was blasted out of the surface during the collision. The team calculates that about 816,000 cubic miles of rock was blasted away. For Head, those findings helped to tie together years for research on Orientale. "I wrote my first paper on the Orientale Basin in 1974, over forty years ago, and I have been studying it ever since," he said. 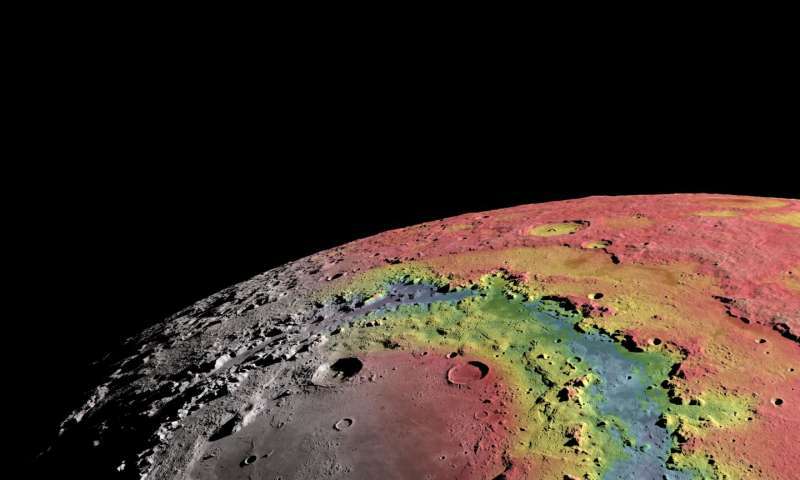 "We now know what parts of the crust were removed, what parts of the mantle and deeper interior were uplifted, and how much ejecta was removed and redistributed over the whole Moon." For the other paper, Johnson led a team of researchers who used the GRAIL data to develop a computer model of the impact and its aftermath. The model that best fit the GRAIL data estimates that Orientale was formed by an object about 40 miles across traveling at about 9 miles per second. The model was able to recreate Orientale's rings and explain how they formed. It showed that as the crust rebounded following the impact, warm and ductile rocks in the subsurface flowed inward toward the impact point. That inward flow caused the crust above to crack and slip, forming the cliffs, several kilometers high, that compose the outer two rings. The innermost ring was formed by a different process. In smaller impacts, the rebound of the crust can form a mound of material in the center of a crater, called a central peak. But Orientale's central peak was too large to be stable. That material flowed back outward, eventually mounding in a circular fashion, forming the inner ring. "This was a really intense process," Johnson said. "These several-kilometer cliffs and the central ring all formed within minutes of the initial impact." This is the first time a model has been able to reproduce these rings, Johnson said. "GRAIL provided the data we needed to provide a foundation for the models," he said. 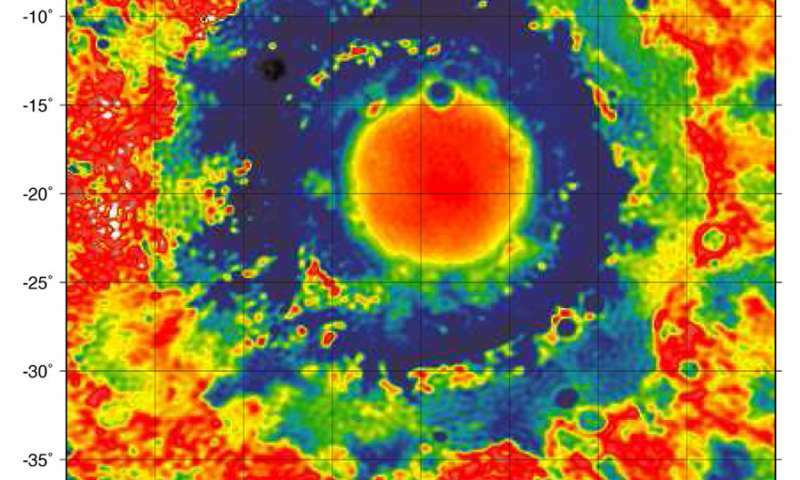 "That gives us confidence that we're capturing the processes that actually formed these rings." Orientale is the youngest and best-preserved example of a multi-ring basin anywhere in the solar system, but it's certainly not the only one. Armed with an understanding of Orientale, scientists can investigate how these processes play out elsewhere. "There are several basins of this kind on Mars," Johnson said "But compared to the Moon, there's a lot more geology that happened after these impacts that degrades them. Now that we have a better understanding of how the basins formed, we can make better sense of the processes that came after." Head says that this research is yet another example of how our own Moon helps us understand the rest of the solar system. "The Moon in some ways is a laboratory full of well-preserved features that we can analyze in great detail," Head said. "Thanks to Maria Zuber's leadership, GRAIL continues to help us understand how the Moon evolved and how those processes relate to other planets and moons."